DeAngelo Hall (toe): DNP on during the week and is OUT for Sunday’s game against the Jets. Hall is believed to have been recovering from his toe sprain faster than initially expected so there is some hope he can return before the bye week. Jordan Reed (concussion): DNP in practice throughout the week and is OUT for the Jets game. On a positive note, Reed was in attendance to watch practice meaning he is no longer feeling symptoms, which Jay Gruden termed a “really positive step”. “It’s up to Jordan and the doctor when he gets cleared”, but getting him to be able to “come to meetings is the first step back to recovery” according to Gruden. DeSean Jackson (hamstring): limited in practice throughout the week and downgraded to OUT on Saturday after not traveling with the team. According to Gruden the receiver felt a “twinge” in his hamstring midway through Thursday’s practice. Numerically, Gruden put Jackson’s health at just 65% on Wednesday in the context that he is “no good to us” at said percent. Gruden continues to make it clear that the team will NOT rush him back, and has also expressed the same idea to Jackson himself who probably wants to get back on the field as soon as possible because of the competitive nature in him. Chris Culliver (knee): after participating on a limited basis on Wednesday, Culliver did not practice for the rest of the week and was ruled OUT for the second week around. Even though Gruden said that Will Blackmon played an “outstanding” game in place of the ex-49er, the team could have still used the expertise of Culliver against Atlanta, especially on the Falcons final offensive possession of the game. Bashaud Breeland (shoulder): limited in practice on Wednesday, but full during the rest of the week after there was significant fear that Breeland was in jeopardy of playing against the Jets. The second year corner is officially listed as probable for Sunday’s game. Breeland was initially described as not having the mobility to raise his arm above his head because of extreme soreness. As Gruden said Monday, the team believed good treatment would do the trick and so far all looks good. Matt Jones (toe): limited in practice after spraining his toe, which has not seen too much improvement leading to an initial game-time decision being downgraded to OUT early Sunday morning. Gruden did not seem too optimistic on Friday because the team expected the injury to have recovered some already but it looks now that the toe sprain will nag Jones too much to play. Kory Lichtensteiger (shoulder/finger): although he was able to take part in practice on a limited basis on Wednesday, Lichtensteiger DNP the rest of the week and was ruled OUT for the Jets game. Lichtensteiger has found himself on the injury report for the past four weeks because of a “finger” injury. Now we know that the starting center played last Sunday’s game with a broken thumb. It might not have been the reason for rather poor play, but it certainly could not have helped Lichtensteiger, who is usually fairly consistent. A more realistic return date for Lichtensteiger might actually be after the bye week, which takes place after next week’s game with Tampa Bay. Josh LeRibeus will take over the center duties against the Jets. Stephen Paea (back): the defensive end was limited in practice due to back soreness and is officially listed as questionable for Sunday’s game, yet another casualty of a severe injury plagued season for the Redskins. Trent Williams (concussion): took part in individual drills on Wednesday but similarly to Lichtensteiger DNP for the rest of the week and was ruled OUT for the Jets game. There was a gray area of what injury Williams had actually sustained because the classification went from a neck strain to a spine injury to now the Silverback being put in the concussion protocol after developing symptoms post-practice Wednesday. Williams is currently in the stage, similarly to Reed, where he can attend all meetings but not participate in practice. The Redskins will lean on backup Ty Nsekhe, not Tom Compton, at left tackle on Sunday. Andre Roberts (quad): limited in practice on Thursday and Friday after just recently straining his quad injury making him questionable for Sunday’s game. Even if Roberts were to miss Sunday’s game, Gruden is confident in the other members of the receiving corp.
Pierre Garcon (knee), Kedric Golston (hand), Spencer Long (knee), Perry Riley (calf), Chris Thompson (shoulder) were all full participants in practice on Wednesday. The Jets also seem to be suffering through a lot of injuries, but they certainly have less impact players missing. 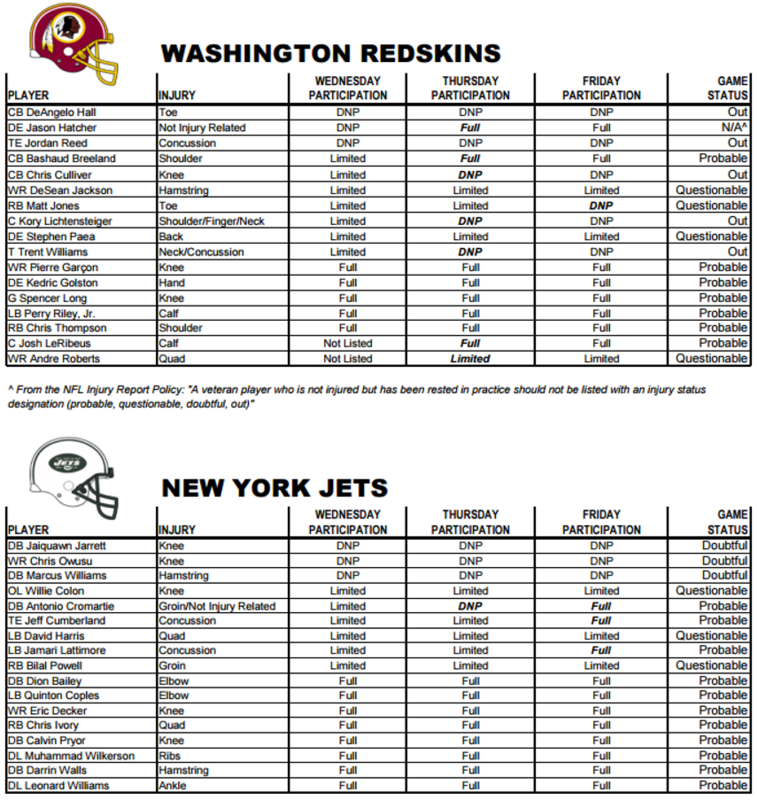 There biggest question marks with regards to availability against the Redskins include RG Willie Colon and RB Bilal Powell who will likely be game time decisions. This post will be updated with the most accurate status of all injured players leading up to Sunday afternoon’s game with the Jets.